The research collection of fishes at TUBRI is the largest collection of post larval fishes in the world, with over 7 million specimens in over 200,000 lots. Recently renamed in honor of Royal D. Suttkus, the collection also features a type room housing 33 holotypes and 38,835 paratypes representing 125 species, a separately curated osteological collection with 1352 specimens (271 species in 55 families) of which 638 (150 species, 20 families) are cleared and stained preparations, 2010 radiographs representing 21,988 specimens from 284 species and 8 hybrids in 36 families, 2428 scale and otolith samples representing 26 species from 12 families, and 77 sets of branchiostegals of two species of Lepisosteus. The collection is divided among two buildings, one housing jar lots of hagfishes through catfishes and the second housing tank specimens and jar lots of minnows through tetraodontiform fishes. Other facilities include a library featuring ichthyological literature and reprints, alcohol redistillation equipment, and a specimen imaging room for 2-D and 3-D imaging of specimens (see Intelligent Fish Identification System description under Featured Projects) . The majority of material in the collection is from freshwater river basins in the Gulf-South region (Texas, Louisiana, Mississippi, Alabama, Florida, Arkansas, Tennessee and Georgia) with diminishing representation northward, north eastward and north westward. The river systems most prominently represented in the collection are, from west to east, Neches, Sabine, Calcasieu, Red, Ouachita, Mississippi, Lake Pontchartrain drainages, Pearl, Pascagoula, small coastal rivers between the Pearl and Pascagoula, Tombigbee, Alabama, and Apalachicola. Colorado River fishes and fishes of other southwestern rivers are well represented. There is extensive representation of Central American (principally Costa Rican) fishes, good representation of the fishes of eastern and central Mexico, and even a few collections of South American fishes. 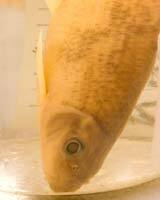 Marine fishes in the collection are mainly from estuaries and inshore waters of the northern Gulf of Mexico. However, the Caribbean Sea and the Atlantic Coast are moderately represented and there is a scattering of collections from the Pacific Coast of North, Central and South America. There are a few collections from the Indian Ocean off Thailand and Australia, and there is material (fresh and saltwater) coming into the Collection from Indonesia. 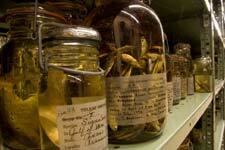 Specimens are contained in Museum-quality, glass jars ranging in size from 4 ounces to 3 liters. The vast majority of the jars are bail-top preserving jars of the highest quality. There are also more than 900 large glass jugs (2-, 3-, and 5-gallon); 160 stainless steel tanks (96 - 36" x 15" x 15" tanks and 64 - 18" x 15" x 15" tanks); 19 wooden tanks (7 - 48" x 20" x 20", 2 - 60" x 20" x 20", 7 - 72" x 20" x 20", and 3 - 96" x 30" x 30") and 52 plastic tanks (44 1/2" x 39 1/2" x 24"). All of the jars in the collection have labels of high quality parchment paper or Tyvec polyethylene fiber. All specimens are formalin fixed. 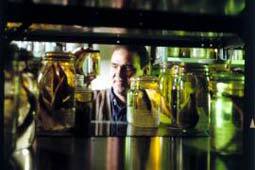 Jar lots are preserved in 70% ethanol; tank specimens are preserved in 50% isopropanol. The collection is completely digitized and 95% georeferenced. Records of the collection are accessible on line through GBIF and the FishNet2 network of fish collection databases, which is presently managed by TUBRI. Anyone interested in borrowing specimens from the collection should take a moment to review our Loan Policy Statement and contact the Collection Manager, Justin Mann.